Wild: While Kentrosaurus aethiopicus is considerably smaller than its close relative, Stegosaurus Regium, it is much more formidable in matters of self defense. In fact, it is arguably the pound for pound champion of not only the Stegosauria, but when encountered in close-knit fighting packs, ranks atop the island’s herbivorous dinosaurs in general. 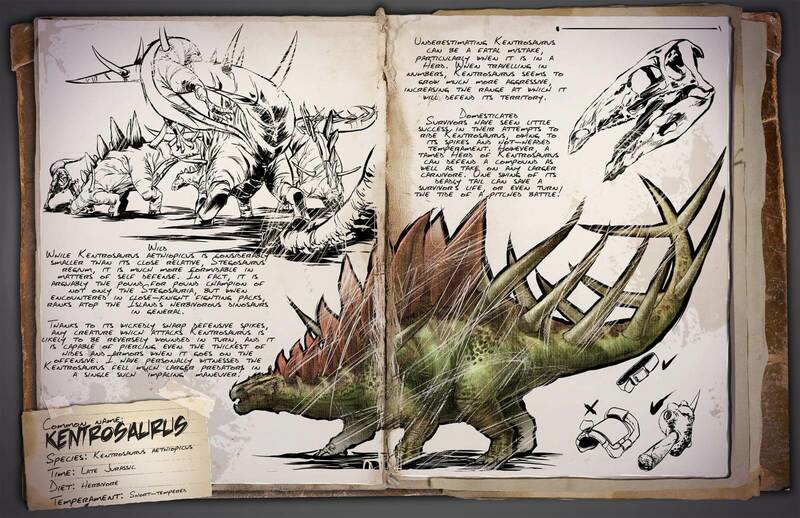 Thanks to its wickedly sharp defensive spikes, any creature which attacks Kentrosaurus is likely to be reversely wounded in turn, and it is capable of piercing even the thickest of hides and armors when it goes on the offensive. I have personally witnessed the Kentrosaurus fell much larger predators in a single such “impaling” maneuver! Domesticated: Survivors have seen little success in their attempts to ride Kentrosaurus, owing to its spikes and hot-headed temperament. However, a tamed herd of Kentrosaurus can defend a compound as well as take on any larger carnivore. One swing of its deadly tail can save a survivors life, or even turn the tide of a pitched battle! Known Information: Underestimating Kentrosaurus can be a fatal mistake, particularly when it is in a herd. When travelling in numbers, Kentrosaurus seems to grow much more aggressive, increasing the range at which it will defend its territory.